February is here, summer is right around the corner, and hopefully there is not too much rain in our immediate future. Wow, a lot of rain and gray cloudy weather these past two months. So much it seems that now I am just waiting for snow to fall. Rain and cloudy days are lovely once every 4 or 5 months for a day or two. I guess we can now say we’ve enjoyed winter, so let’s fast forward into spring already. Just as bad as the rain is the Coastal Highway 003 from Peñasco to San Luis Rio Colorado. Well, actually to El Golfo de Santa Clara is really the only bad part. We spent the New Year in California with family and friends, and came down through Yuma and across the Coastal Highway because it saves us more than one hour in travel time. The highway is awesome to drive on…in the daytime! No potholes, wide lanes and good lane markings and reflectors for night driving. Getting through San Luis is very easy and even easier if you get pulled over for inspection, as we did coming home. (You just make less turns to get onto the main road through town is all.) And the Coastal Highway was great all the way to El Golfo de Santa Clara even considering all of the rains we’d recently had. The problem came as soon as we turned onto the Coastal Highway. I can use an OMG! Here. I would say a good 75% of the highway was horrendous as far as safety goes. I was driving at night, which I often do, because I know the roads and I never leave anywhere on time – so I am always running late. And, granted, my vision is not perfect, but I don’t (really) need glasses, which I am seriously reconsidering after this last trip. Some more construction that will affect travelers is the construction going on in Sonoyta. And thank goodness it is finally happening! Since December the main road (Highway 2) through Sonoyta is being dig up and repaved. If you’ve driven over it in the past 3 or 4 years then you know how rutted it has gotten. I always feel sorry for the men that sell the fruit in the middle of the street at the stop sign. He really takes his life in his hands every day just to make a few bucks! It will be awesome once it is all finished. Now if we can get an alternate route through town (other than the wash) I think my complaining might be done for the year. NOT! I am not going to tell you what day I am writing this Editorial, but let’s just say that I am guessing you will not be watching the Packers at the many Superbowl parties around town. If you are planning on being in Rocky Point for the big game then reserve your seats or get to your favorite haunt early because everything fills up so fast! Also in February we can look forward to the 3rd Annual Boo Bar Poker Run, as well as the 9th Annual Taste of Peñasco being hosted at Hotel de Peñasco at the end of Calle 13 on February 18th. That is always a lot of fun. And, we will be having a Hot Air Balloon Festival on the 24th and 25th of the month out at Laguna del Mar, and you should be able to see them from all over the city. 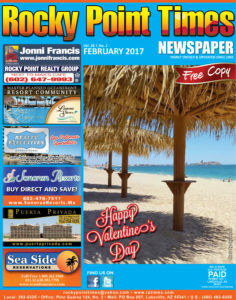 Lots of things going on in February so be sure to check the Events in this issue and get up-to-the-minute info on our Facebook Page. Oh, and speaking of FB, apparently there is some asshat that has used our name to start their own Facebook Page. So, if you are new to Facebook, just make sure you are on the correct page. And that goes for anyone on Facebook or pretty much the entire web – take a few extra minutes to make sure you’ve got to the right people or page. Many of you knew and went to Dr. Shelly Persad who had Puerto Peñasco Chiropractic here in town, and who has left us for greener jungles. I am happy to say that Dr. Richard has taken over the vacancy left by Dr. Persad, which makes us all who need a good chiropractor, very happy. We all say, Bienvenidos! 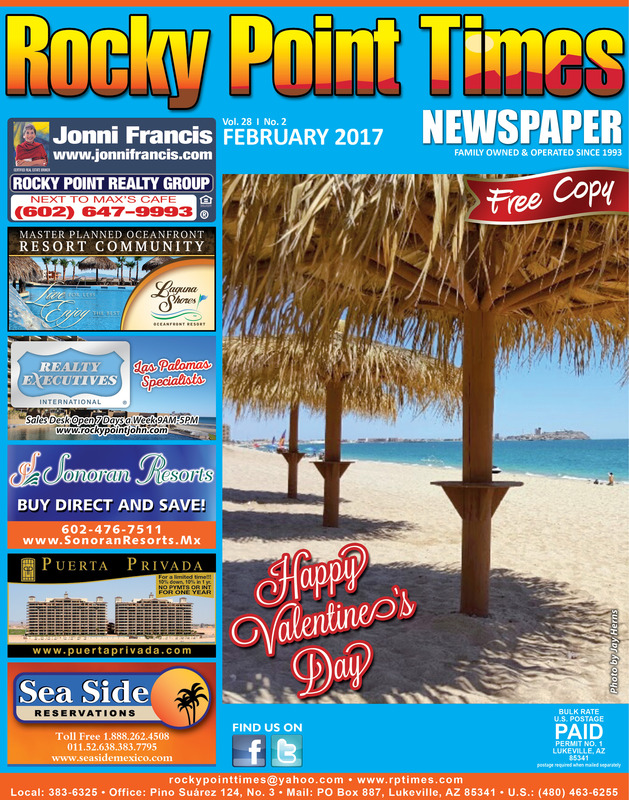 On a final sad note, we said farewell to a Rocky Point Legend last month. Rodger Clifton can be called one of the pioneers of this city. If you’ve been around here as long as I have, then you will remember all that Rodger and his family have done for this community. His generosity was a first and truly life changing for many. Plus he was a lot of fun too! I believe he can be counted as one of the pioneers of the modern day Peñasco, and will be remembered by many.